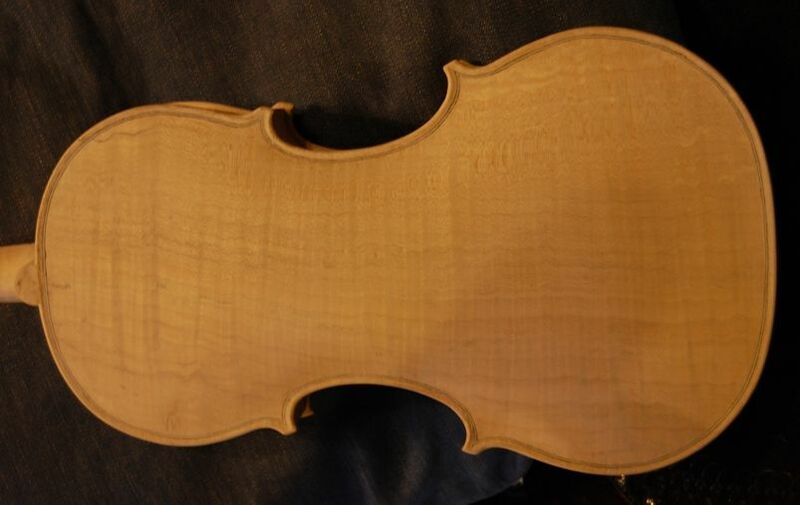 We looked last time at the viola with the edgework incomplete, and final scraping not done. 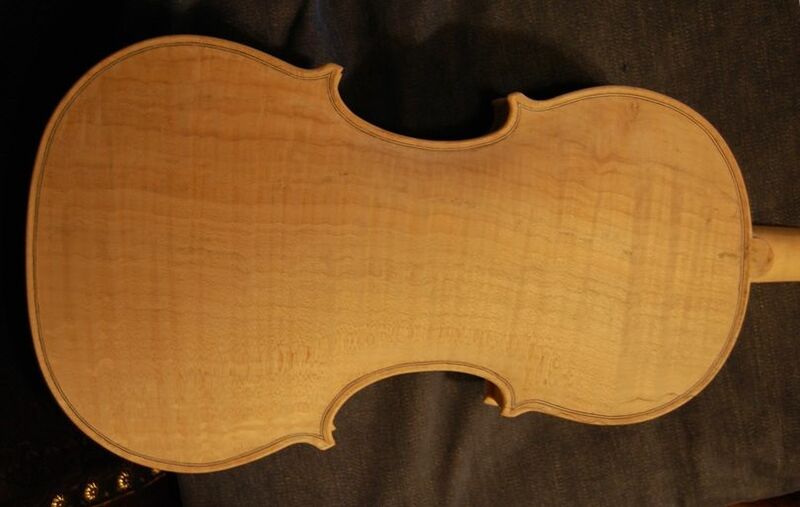 Here is the viola with the edgework done. 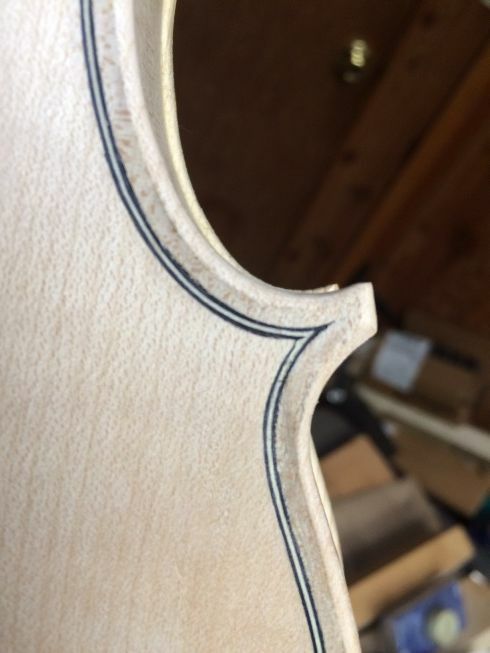 Notice that the outer edges have been rounded inward to meet the edge crest, so that the junction between edge crest and purfling channel makes a clean ridge around the perimeter of the viola. This is just something I do, because I like it…as far as I know, it has no functional value. 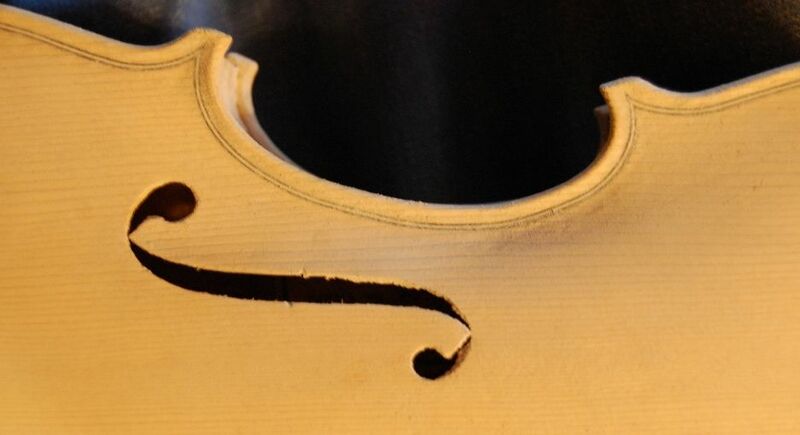 Many old master instruments have a much less clearly defined crest. 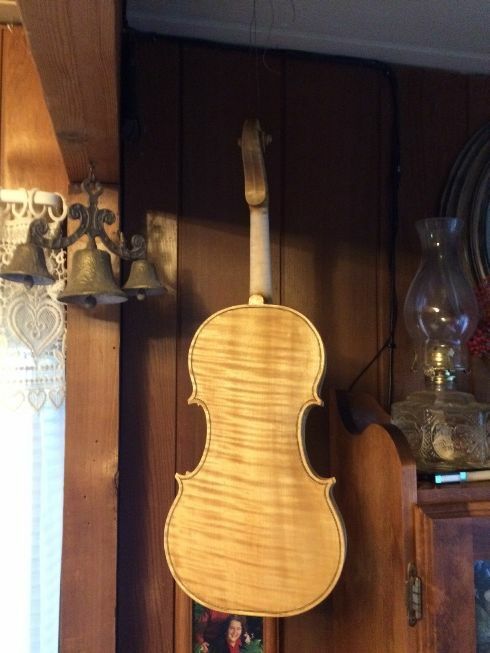 Then I wet the fiddle down with coffee, to raise the grain and add some color. 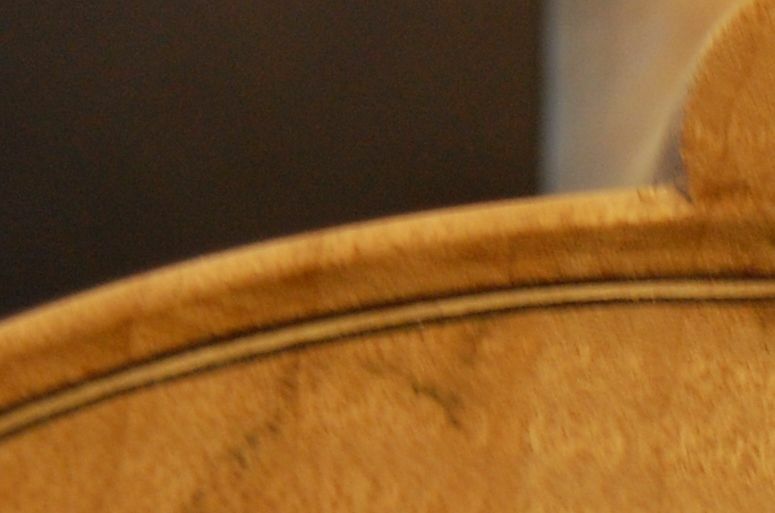 One result is that my edgework all needs to be reworked with a small, sharp scraper. 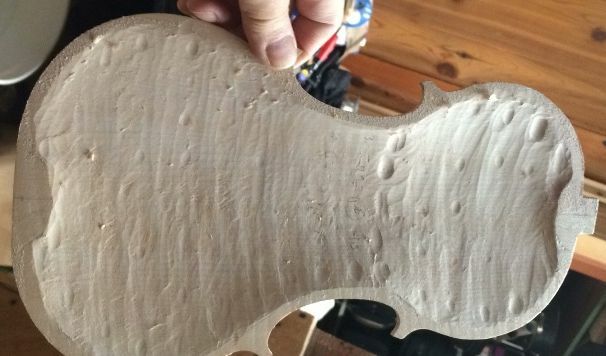 The other is that the whole instrument needs to be re-sanded, using 400-grit sandpaper. 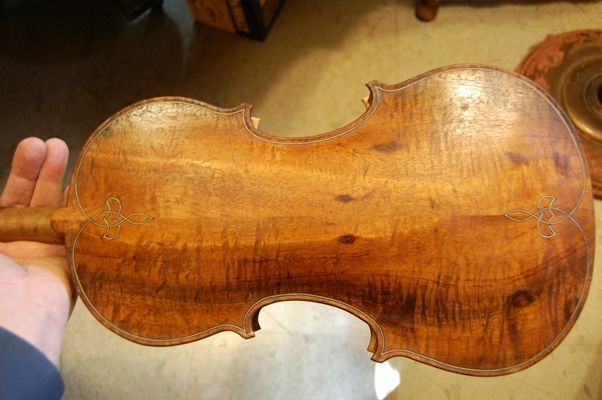 The water in the stain raises the grain, so that every random fiber that is not closely tied to the surface will swell, and raise up, making the whole surface very rough. So I deliberately raise the grain, and then scrape or sand off the rough surface. Using a very sharp scraper, very lightly, just “brushing away the rough stuff” is probably the best way to do this. I use a scraper for the areas where I want detailed, clean edges, and 400-grit abrasive paper for the broad surfaces. I perform this step at least twice, before moving on to the mineral ground. The result is a surprisingly light, yellow-tan color, all over. Almost just a cream-color. 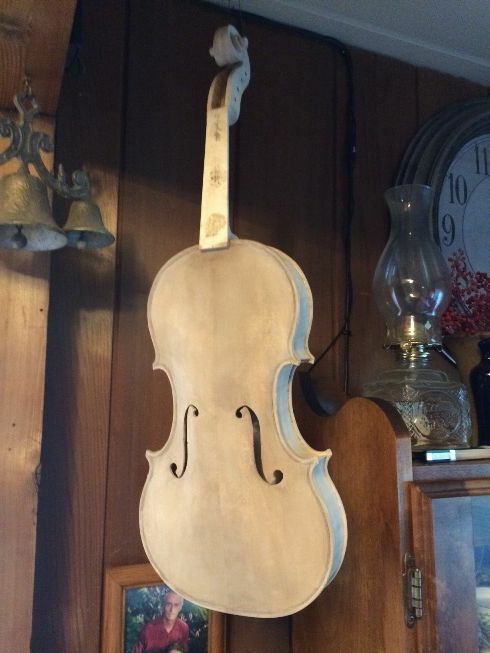 It will darken up nicely under varnish, though, and not glow white from under the varnish. Come to think of it, the above photos already have the coffee stain, too. I forgot to take photos of just the edgework, I guess. So–those photos are right before I applied the mineral ground. This is a suspension of very fine particles of gypsum…in a coffee-solution, because I still want to add more color, if I can. Other people use other minerals–finely ground mica, finely ground glass, microscopic beads of glass, clay, volcanic ash or other non-organic nano-particles. Some omit this step entirely. Roger Hargrave shared this as having had an important effect on his sound, so I have tried it, for the last several instruments, with what seem to be positive results. I keep the solution well-stirred-up, and brush it on liberally, then rub it into the wood with my fingers, as vigorously as I can. Finally, I wipe off as much of the excess as I can, using a rag. The stuff goes on looking brown, because of the coffee, but dries to a chalky-white film. 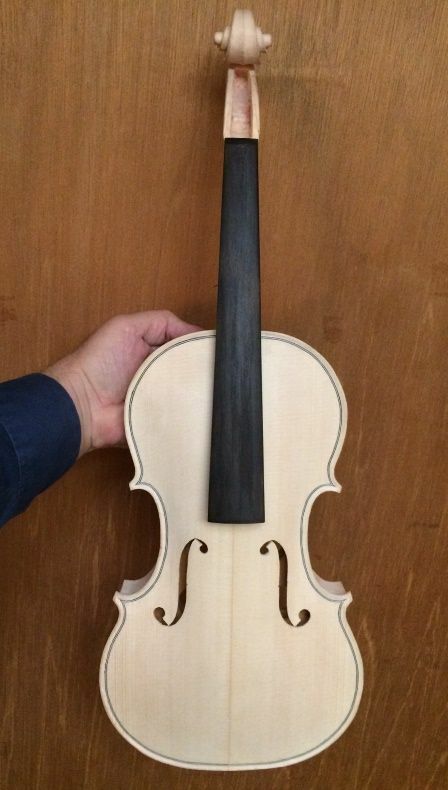 I don’t particularly want it on the wood– I want the microscopic particles to fill the pores in the wood, so that the varnish will be less likely to soak deeply into the wood, and deaden the sound of the viola. The ground dries rapidly, leaving the whole viola a chalky-white, ugly object. 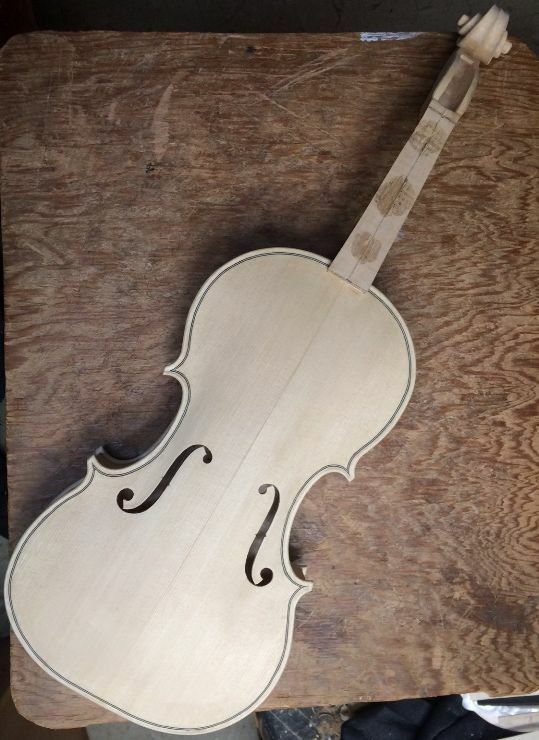 I go over the dry instrument, checking everything, and scraping or sanding off all the excess ground. 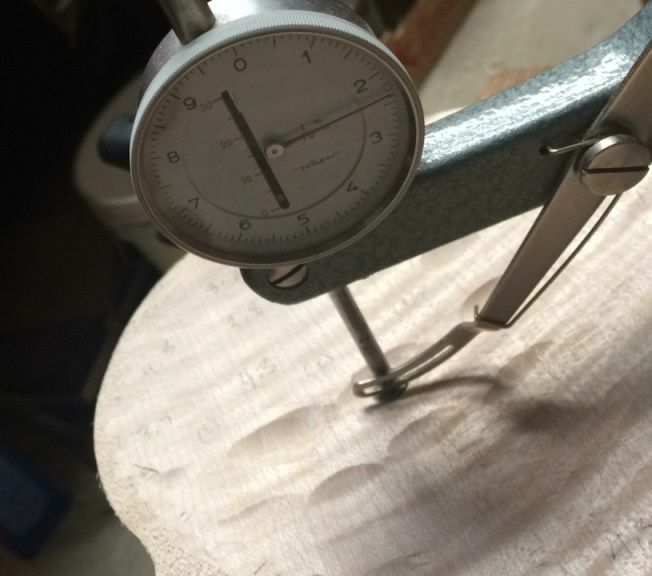 When I can see the grain of the wood everywhere (though dimly) through the gypsum film, I apply the sealer coat. The ground dried rapidly– this was only about three minutes after the above picture. And this was only about five minutes. Here it is, dry–without the flash. In daylight this is chalk-white. See how the grain is obscured. And the front– you can see the excess pretty easily. 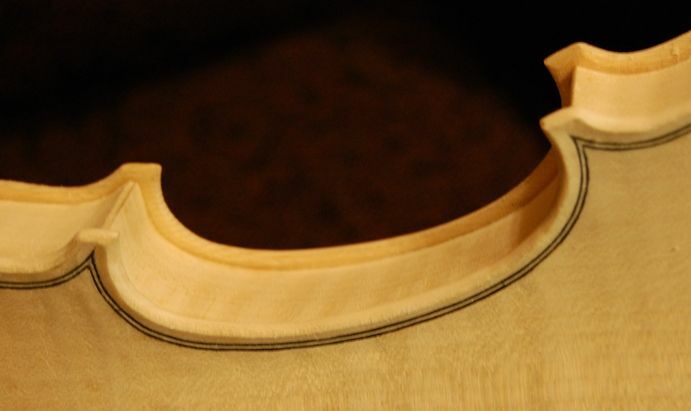 Here, you can see the excess ground in the f-holes, and along the purfling. 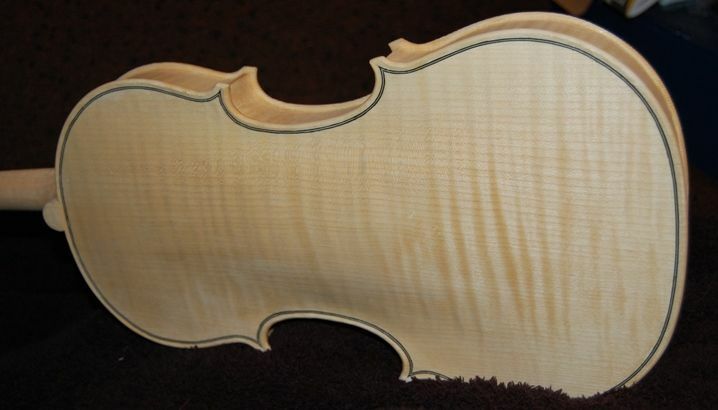 Viola front is ready for sealer– all the excess mineral ground has been cleared away. The back, ribs and scroll have been prepared, too. All are ready for the sealer. 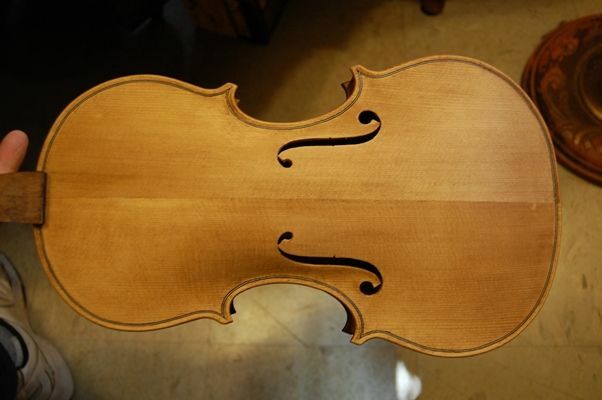 Some use a very thin varnish. Some use commercially available sealers. Currently, I am using a very thin mixture of pine pitch and turpentine, with a little alcohol. The alcohol and turpentine cause the mix to penetrate deeply. 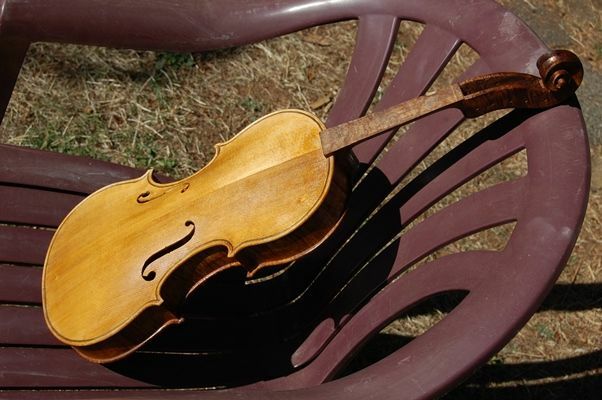 The pine-pitch goes into the wood along with the solvents, and remains there. 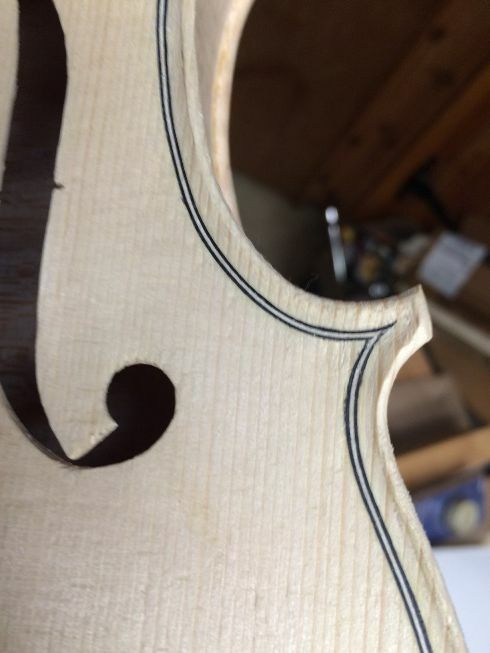 It is interesting to watch the sealer going on…the chalk-white gypsum instantly turns transparent, and effectively disappears, leaving the natural color of the wood, along with whatever staining was added. 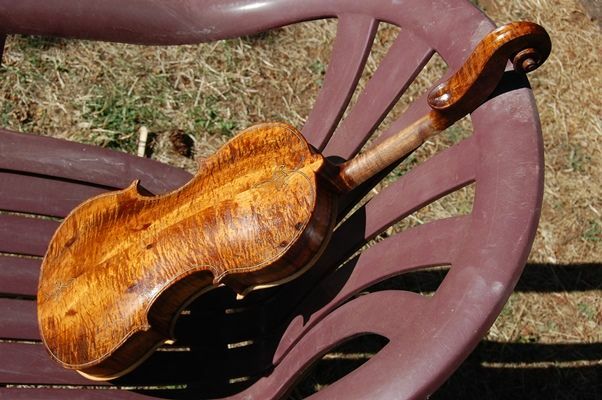 Without adding any color to the sealer, this would leave the wood a somewhat pale color. Usually, I have been satisfied to add color later. 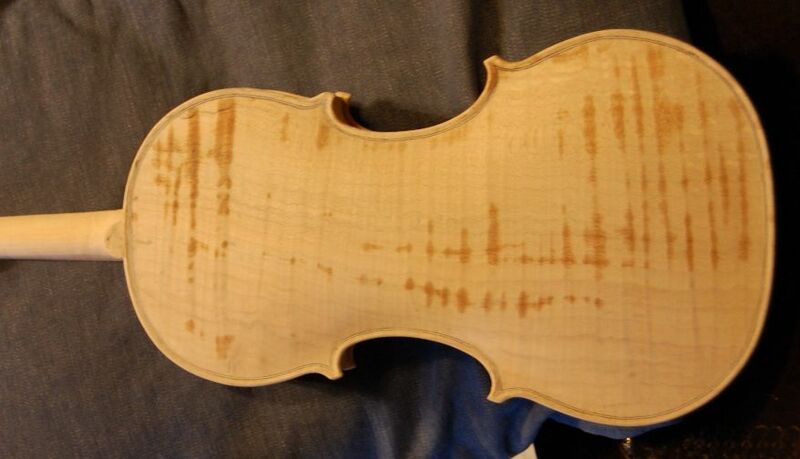 I added a little amber color to the sealer, this time, though, because my last instrument was a little too light-colored, initially, and I didn’t like the result. The alcohol evaporates nearly immediately, while the turpentine takes a few days to evaporate, and (I am told) it leaves a bit of residue, as well. 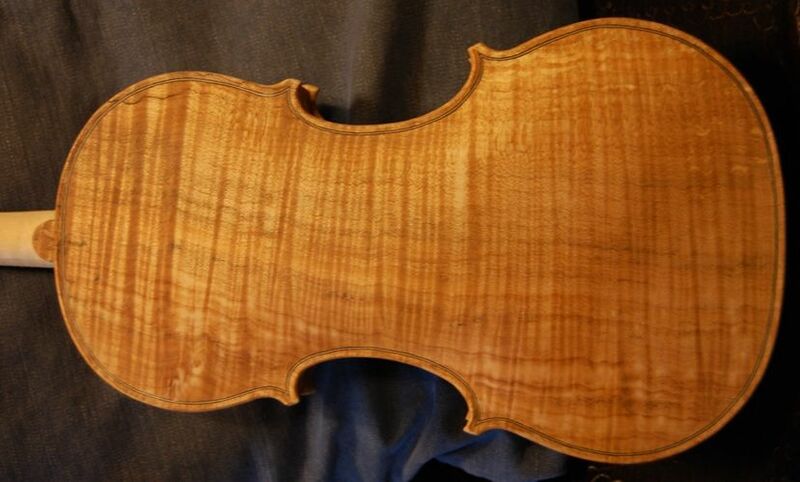 But that is OK. Turpentine is a natural wood extract, and I don’t mind it being in the wood. 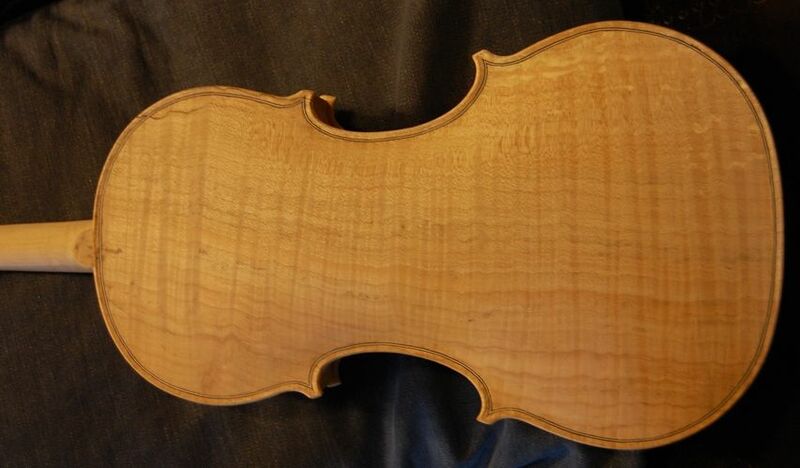 Here is the viola with just the sealer. I will show the varnishing sequence in the next post. Sealed Front., using the flash. And…here’s the freshly-sealed back; again, using the flash. Finally I rub the surface with extremely fine abrasive (12,000-grit micro-mesh), and then polish it all over, using the dry skin of my palm, or thumbs, rubbing hard enough that the varnish gets uncomfortably hot. This takes away the “glittery” look of the fresh varnish, and leaves the glow of hand-rubbed work. Pictures in the next weblog post. 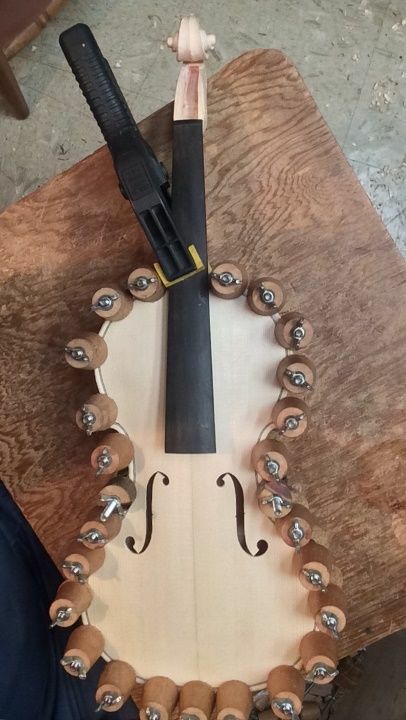 All set-up issues: saddle, fingerboard, nut, pegs, soundpost, bridge, endpin, strings, tailpiece and (on the smaller instruments) chinrest. I scribe a margin around the entire outer edge, usually about 1.6mm in from the outer edge. This will serve as the “limit” for the channel. 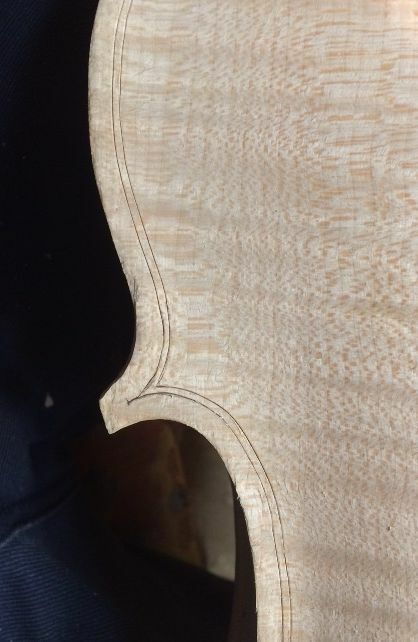 I cut the channel to the desired depth, using gouges first, then small planes and scrapers, bringing the smooth curve up to match the scribed limit. Then I file the outer edge so that it curves in from the center of the edge of the plate up to meet the scribed margin of the channel. The other margin of the channels are scraped so that they fair into the curve of the plates themselves. I true-up all my lines using scrapers, files, and very fine abrasives, and then I am ready for final varnish preparations. 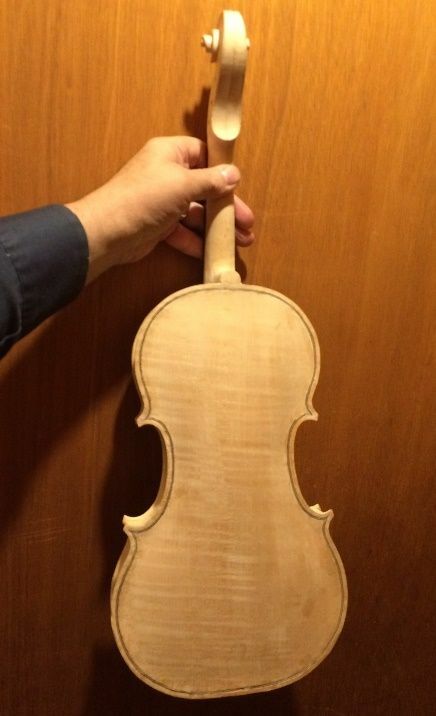 On my last post, I had just completed the back purfling. That seemed a good place to “call it a night”. 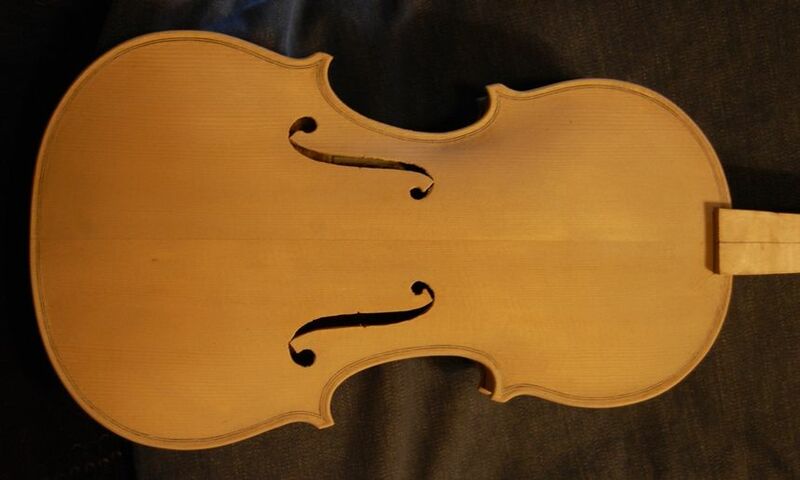 Back purfling complete: the channel has not been started. 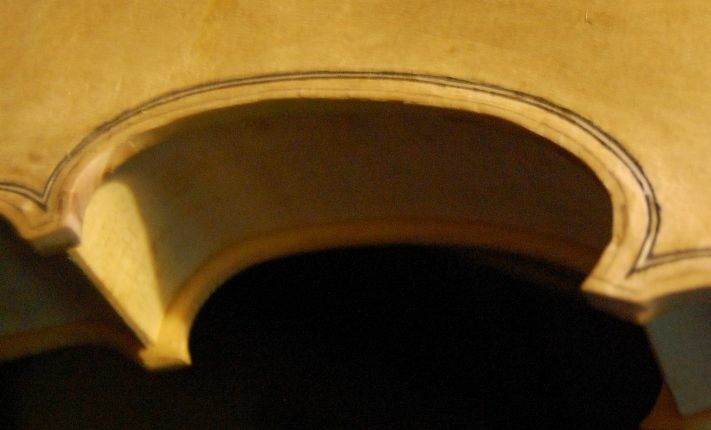 You can see the sharp edge of the purfling in a few places. Scribed line, marking the edge of the channel. Beginning the channel cut. 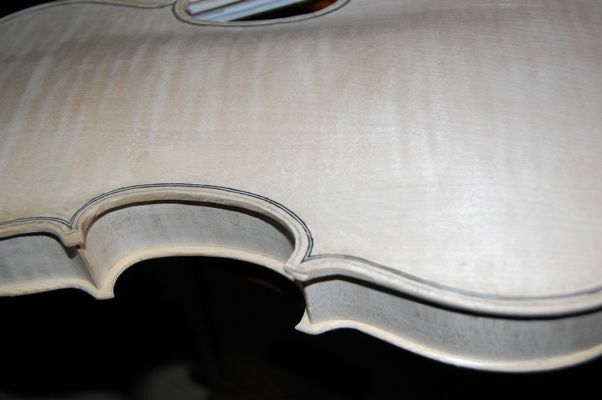 The purfling looks cleaner, as the rough, glued edge is gone. 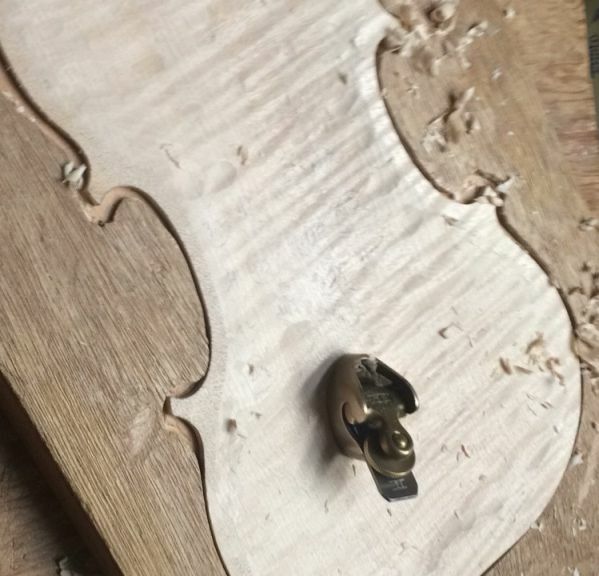 I also began shaping the edges. I have a particular spot on my basement stairs, where I can get a very low-angle, not-too-bright light source, which casts shadows across the face of the instrument, and makes is easy to see irregularities. 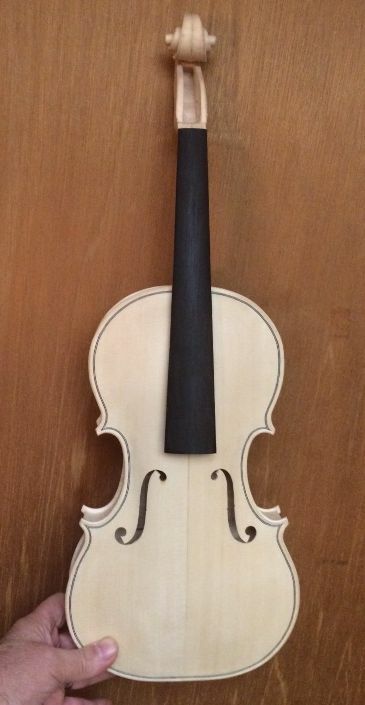 So, the last thing I do is stand there, holding the fiddle and rocking it very gradually, to see any shadows that indicate a rough spot or an irregular shape. When I find one, I gently scrape it away with a very sharp scraper. 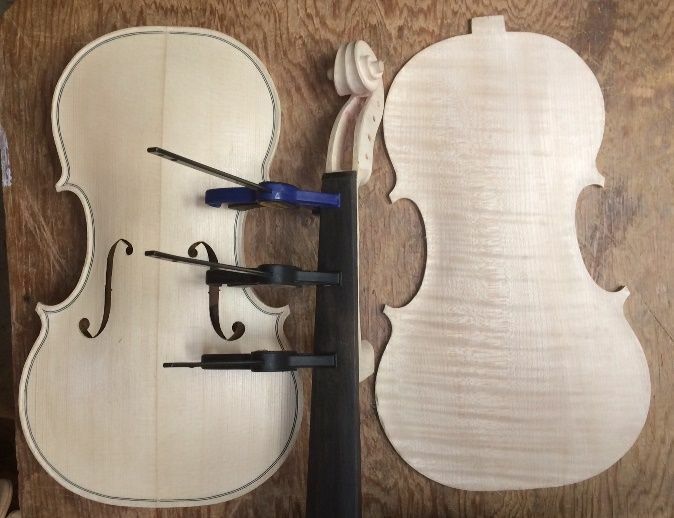 I want to move as little wood as possible at this point in the build: I already have the arching and graduation just about exactly where I want them to be. This is strictly fine-touch finish-scraping. Some people are very particular about not using ANY abrasives. Sorry– I do use them, in a very limited way, but only at the very last part of the build. The edges of the spruce plate, for instance, are so soft that a scraper is simply too aggresive for final shaping, especially after I raise the grain with my water-based stain (strong coffee, in my case…yes, and I drink the leftover “stain.”) So I use a very fine (worn 400-grit) abrasive paper to make the edges smooth and pretty. 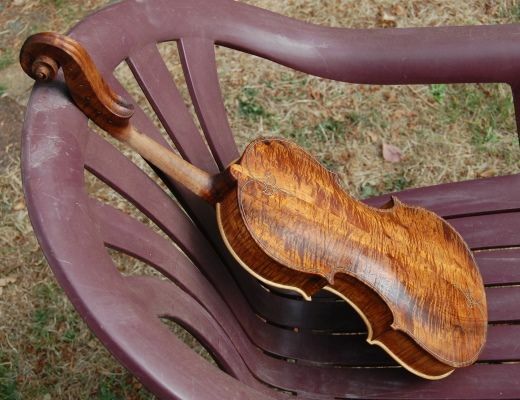 I also use it later, between coats of varnish, to make sure that no bits of dust, splinters, etc. 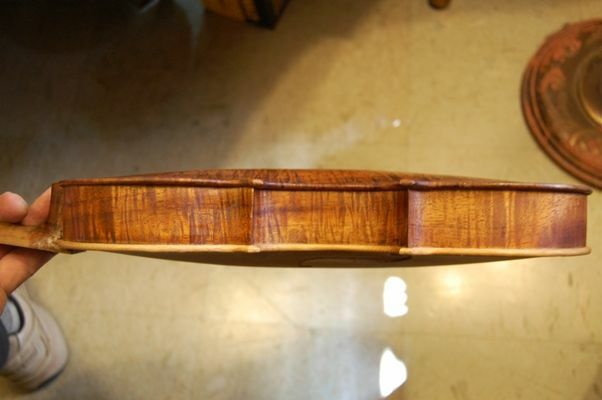 can spoil the next successive coat(s) of varnish. Channel and edgework complete…no flash. The wood isn’t really this yellow– we have a fairly dark house, and the sunlight filtering through makes it look this way. Same shot of the completed channel, with flash. This is pretty close to the real color at this point. Coffee stain, not fully dry yet. I used the flash on this, so the color change is real. This is something I got from Roger Hargraves. 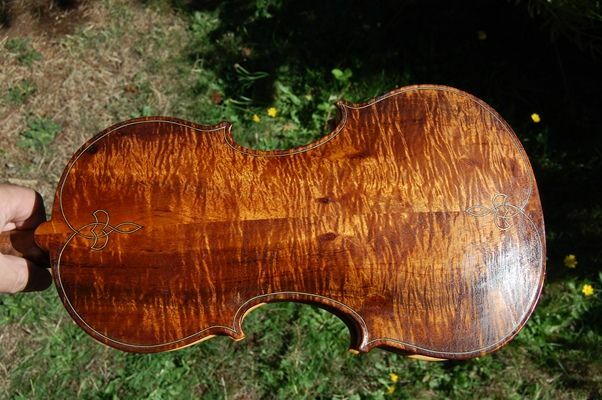 He is a master luthier living in Germany, and he wrote an online book as he built a magnificent double bass. In it he explained why he uses a mineral ground, and what it is (it is effectively exceedingly fine gypsum dust, introduced into the wood pores in a liquid suspension. He used a very thin varnish as I recall…I used coffee, again. It dries slowly, is easily applied, and cleans up with water.) So, I apply the mixture with a brush, one area at a time, rub it in with my fingers, and immediately rub back off as much as I possibly can, using a rag. 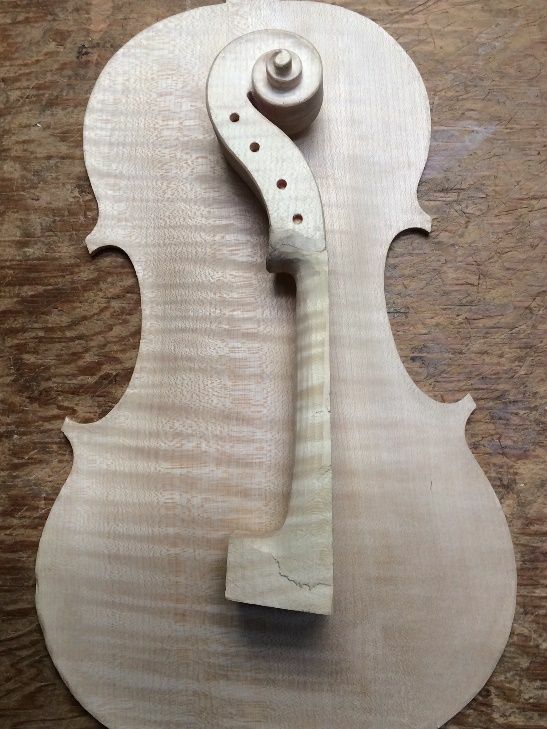 I do NOT want a thick layer of stuff on top of the wood– I want the pores themselves to be filled with the particles. 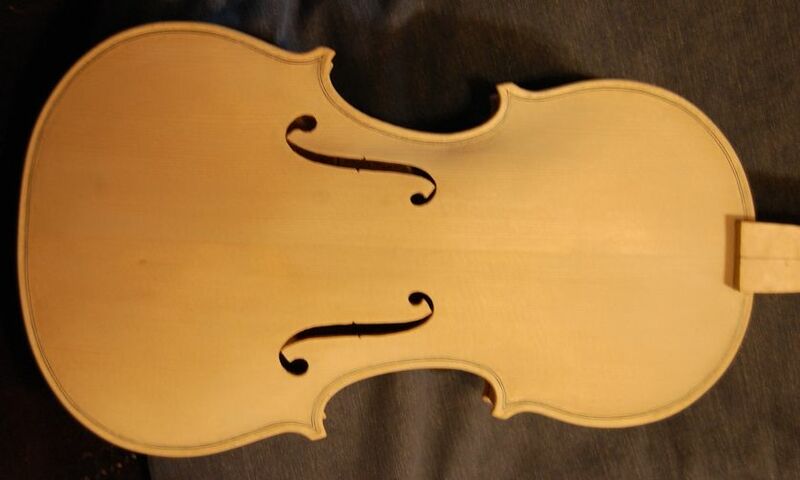 I coat all areas except the “handle”portion of the neck in this manner. 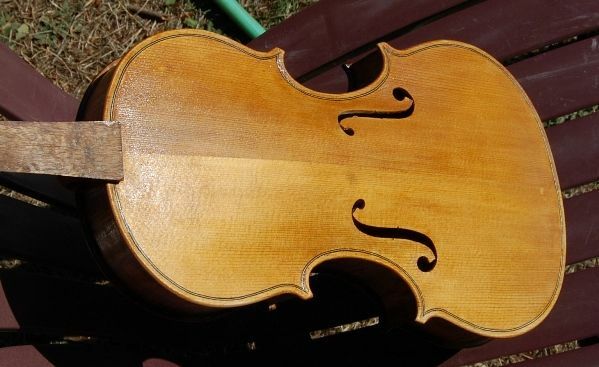 Supposedly it leeps the varnish from saturating the wood, thus avoiding overloading the wood with varnish and deadening the sound. Does it help? He says it does, and I know for a fact that he did it…and I saw the bass in person, last year at the International Bassists Society convention, in Ft. Collins, CO. The ground dries chalk-white, in spite of the fact that I used coffee for the liquid. I sand it gently to remove any excess gypsum (there always is a fair amount that comes off the surface at this point). Sorry, I didn’t take a picture at this point. 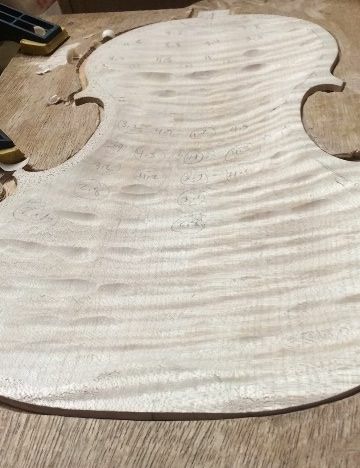 You’ll have to take my word for the fact that it simply looked like a chalk-white violin, with the grain and purfling quite obsecured by the dry mineral ground. Mineral ground renedered transparent by sealer coat. I’ll show the varnishing process in the next post.